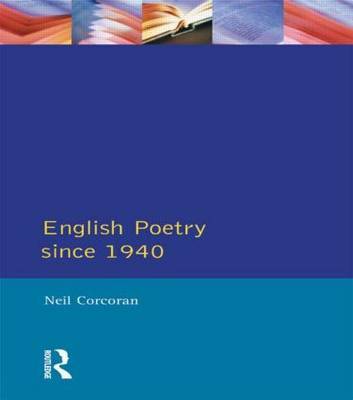 Neil Corcoran's book is a major survey and interpretation of modern British poetry since 1940, offering a wealth of insights into poets and their work and placing them in a broader context of poetic dialogue and cultural exchange. The book is organised into five main parts, beginning with a consideration of the late Modernism of T. S. Eliot and W. H. Auden and ranging, decade by decade, from the poetry of the Second World War and the `New Romanticism' of Dylan Thomas to the Movement, the poetry of Northern Ireland, the variety of contemporary women's poetry and the diversity of the contemporary scene. The book will be especially useful for students as it includes detailed and lively readings of works by such poets as Ted Hughes, Seamus Heaney and Philip Larkin.